After a total redesign last year, the F-150 came out of the blocks with more than thirty awards, including the North American Truck of the Year. Building on a chiseled, muscular exterior and modern, ergonomic interior, the 2005 Ford F-150 added the top-tier King Ranch Package to the lineup on one end of the spectrum. On the opposite end, a new entry-level Work Truck Package raises the bar in the commercial segment. From a safety perspective, seat occupancy sensing technology (front row) was also on the menu for the 2005 Ford F-150. This feature would allow the supplemental inflatable restraint system to discern whether there was sufficient weight in the passenger front seat to allow airbag deployment in the event of a vehicle collision. Lightweight, small children may be injured during airbag deployment. This new feature could help to eliminate that. With its wide athletic stance and high beltline, the exterior aesthetic of the 2005 Ford F-150 is the culmination of five-decades of "Built Ford Tough" reliability, durability, and power. The sleek new headlight and grille design makes a first impression that screams durability and quality. A maximum towing capacity of 9,900-pounds, combined with a maximum payload capacity of 3,000-pounds, made the 2005 Ford F-150 the most capable pickup truck under 8,600-pounds. Whether consumers chose the hard-working F-150 XL, the sporty F-150 SXT, the athletic F-150 XLT, the powerful F-150 FX4, or the luxurious F-150 Lariat, Ford trucks were up to the task of taking on the hard jobs and making them seem a whole lot easier. 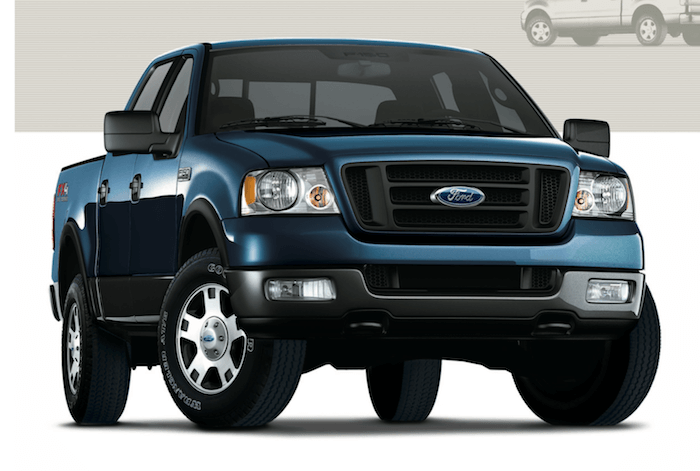 The boldest addition for the 2005 Ford F-150 was the new King Ranch Package. The King Ranch epitomized what luxury pickup truck lovers had clamoured for as long as pickups had been in production. With the new 300hp, 5.4-liter, 3-valve, SOHC, Triton engine and fully boxed frame with hydroformed front rails, the 4WD King Ranch was as tough and powerful as it was strikingly beautiful and elegant. The fully boxed frame was nine times stiffer during driving maneuvers and fifty-percent stronger against bending than previous models. This improved the overall ride quality and comfort level of the 2005 Ford F-150. It also virtually eliminated shake and shudder on rough terrain. Liquid-filled engine mounts reduce noise and engine vibration even before it exits the engine bay. Added sound deadening insulation provided another layer of noise protection that yielded the most peaceful riding experience ever in a pickup truck. To further eliminate road noise and vibration, 2WD and 4WD models of the 2005 Ford F-150 are both equipped with coil-on-shock, long-spindle, double wishbone front suspensions with cast aluminum lower control arms. Cast aluminum absorbs road noise and vibration helping to make the 2005 Ford F-150 the quietest and smoothest pickup in the segment. New drive-by-wire throttle on the 4.2-liter V6 engine provides consumers with pinpoint accelerator control while optimizing fuel efficiency and performance. Base pricing is as follows: XL $19,610; STX V8 $22,380; XLT $24,640; FX4 $30,955; Lariat $29,755; King Ranch $35,530. MSRP stands for manufacturers suggested retail price. Highlights of the 2005 Ford F-150 included the addition of the King Ranch Package, as well as safety and efficiency improvements. 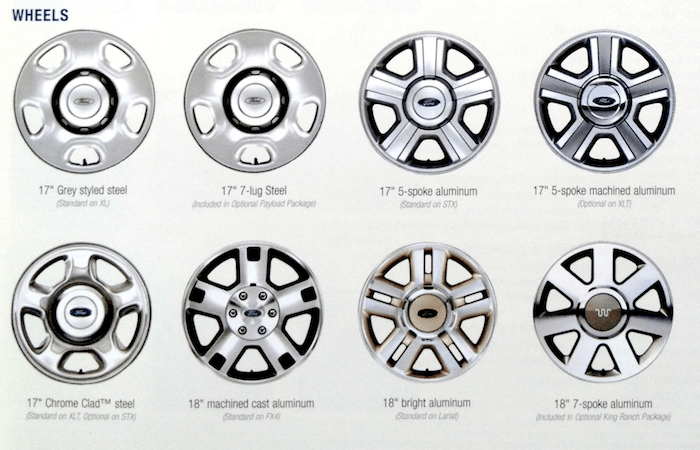 There is no doubt that seemingly small additions like these have helped the Ford F-150 to remain on top of the heap (in vehicle sales) for the last forty-years.